Frontiers in Psychology was launched in 2010. In just 4 years, it has become the largest and the 2nd most-cited psychology journal in the world . There are 597 journals listed in the category of Psychology in the 2014 Journal Citations Reports (JCR) provided by Thomson Reuters in 2015. Frontiers in Psychology is one of the 19 Gold open-access journals. Figure 1. Frontiers in Psychology compared to 19 open-access journals listed in all 11 JCR Psychology categories. The journal analysis is based on the 2014 Journal Citations Reports published by Thomson Reuters, 2015. Figure 2. 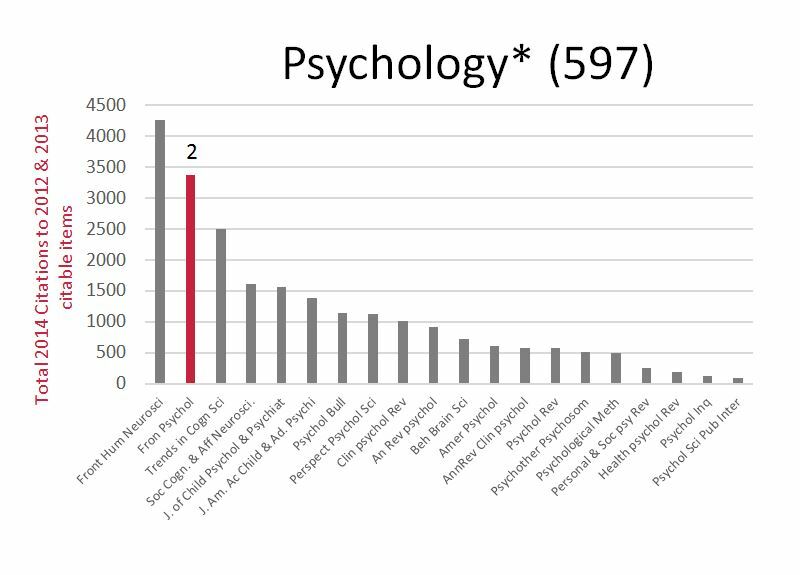 Frontiers in Psychology compared to all 597 journals (subscription and open access) listed in all 11 JCR Psychology categories. The journal analysis is based on the 2014 Journal Citations Reports published by Thomson Reuters, 2015. Figure 3. Top 20 most-cited journals in Psychology in 2014 (citations in 2014 were counted for articles published in 2012 and 2013) in all 11 JCR Psychology categories. The journal analysis is based on the 2014 Journal Citations Reports published by Thomson Reuters, 2015. Is the largest open-access journal in Psychology – 27 times larger than the average article volume in open access journals in Psychology. Is the 2nd most-cited journal in 2014 based on articles published in 2012 and 2013 (second to Frontiers in Human Neuroscience). 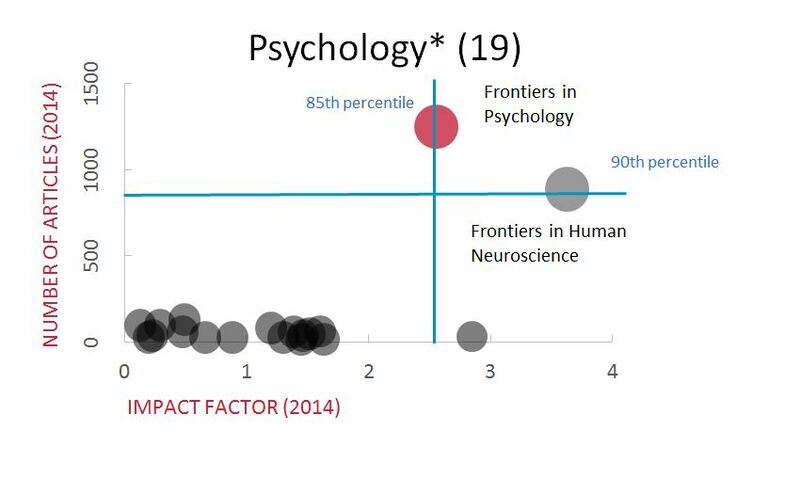 In summary, Frontiers in Psychology, one of the youngest journals publishing peer-reviewed scholarly articles in psychology, has become the largest and 2nd most-cited journal in psychology with an impact factor in the top 21%. Frontiers in Human Neuroscience, also listed in the 2014 JCR category of Psychology, is the most-cited and 2nd largest Psychology journal. Other Frontiers journals listed in the 2014 Journal Citation Reports follow a similar pattern – view the analysis here. 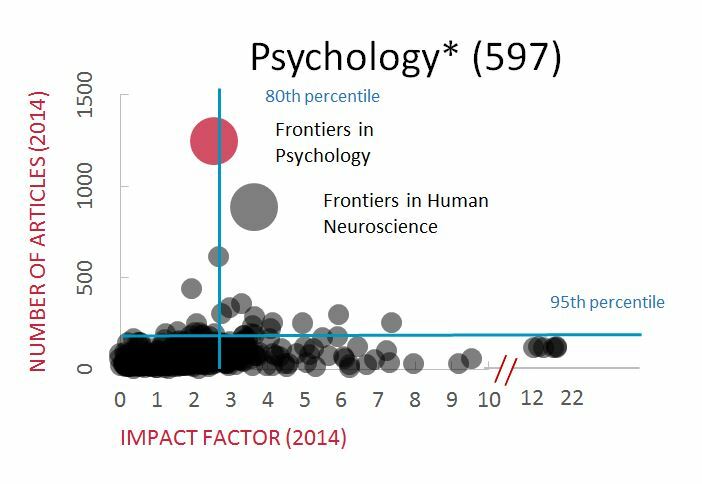 That post-hoc selection of the top 5-10% most cited articles in Frontiers in Psychology(as other journals try to do on submission) would result in an Impact Factor above 10. All of this is only possible with a stellar editorial board of researchers (see infographic). Frontiers congratulates Field Chief Editor Axel Cleeremans for leading this field so successfully, the stellar board of Specialty Chief Editors (see below) for their work in building the community, the Associate Editors for safeguarding the integrity of the Frontiers peer-review and the outstanding Review Editors for their dedication and diligence in the peer-review process as well as the Frontiers Journal Management team for their support to the editors.